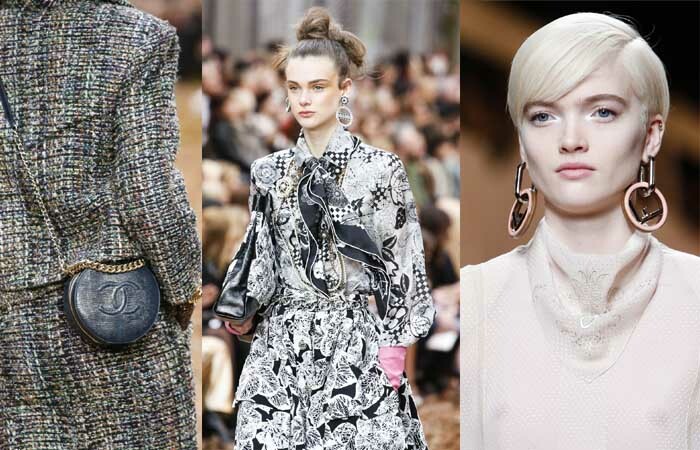 40+ Style » fall / Winter 2018 trends » The best accessory trends for Fall 2018 that will transform your look! 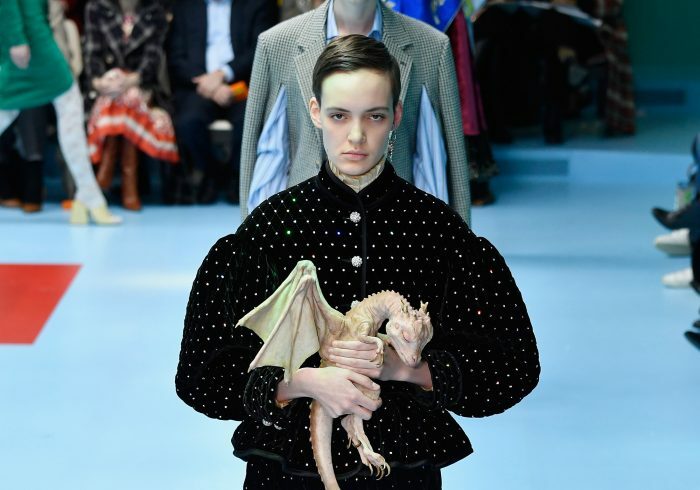 The most outlandish Fall 2018 accessory seen on the catwalks had to be Gucci’s baby dragons! Perhaps Gucci really loves Game of Thrones. But, unless you can train your dragon to carry your credit card and phone, it’s probably not very practical. Spice-Girl-turned-fashion-designer Victoria Beckham joked she had created bags so big for her Fall 2018 collection that she would be able to fit all of her children inside! We’re not sure about that. But, she’d definitely have space for at least the youngest of the Beckham clan! Plus, she wasn’t the only one to embrace the big bag trend. It was also seen at other shows, including Loewe, Chanel and Alexander McQueen. The only problem is, I’m bound to lose my keys at the bottom! The biggest versions are definitely best left as weekend bags! If you’re not keen on lugging a huge handbag and all of its contents around (and, let’s face it, who wants to carry that around all day? 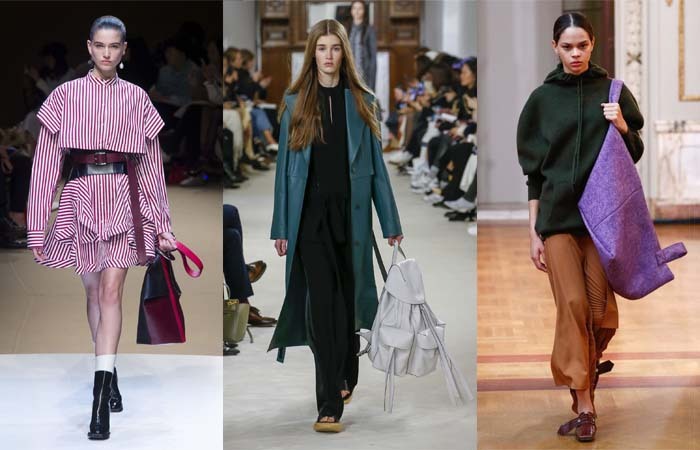 ), then another big (although, actually smaller) trend for Fall 2018 is the brightly colored handbag. Just as one of the major shoe trends for the colder months was primary and bright colors, handbags were also bright and bold. These are the ideal partner to provide some oomph to all-black looks. What could be more appropriate for autumn than designs featuring autumnal leaves? This is definitely one of my favorite trends for the season. Leaves were used not just in textiles but also in designs of brooches, necklaces and earrings. I’ve always been a big fan of Tiffany’s olive leaf jewelry (if anyone is wondering what to buy me for Christmas!) and the creations from high end and high street this season are just as beautiful. Who doesn’t need a bit of bling for the festive season. Tassel earrings were the biggest earwear trend for summer. And, there were still plenty of those on the catwalks for fall, in metallic shades this time. But, designers decided to add some serious shine for fall and winter. The oversized chandelier earrings were perfect for Christmas and New Year parties. Pair with a little black (or navy) dress, and you’re good to go! Although I wouldn’t like to wear a pair as big and heavy as those shown by Tom Ford! 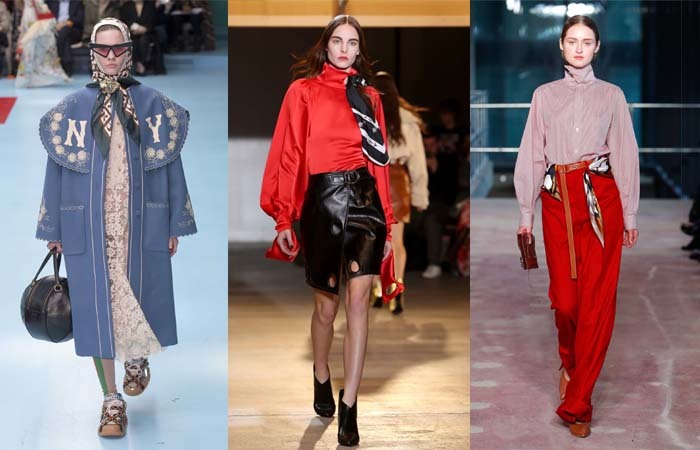 Silk scarves proved the inspiration for flowing dresses on the Fall 2018 runways, so it is no surprise that silk scarves also featured heavily as accessories. But, while there were plenty of scarves worn around the neck, they were also used as bag straps, headwear, belts and even as unconventional ways to tie shoes. This is a trend that could have been made just for 40+ stylish Ruth Essex who loves wearing gloves, as she shows in her style interview! 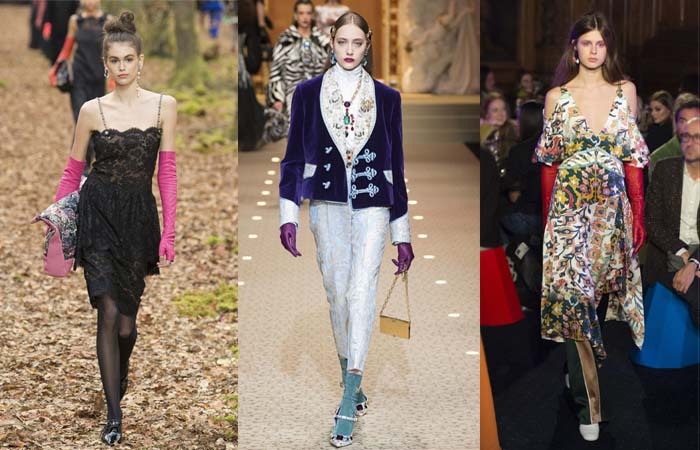 Just as designers have taken inspiration from days gone by in looks featuring heritage checks, silk scarves and oversized sunglasses, the likes of Chanel, Karl Lagerfeld and Jeremy Scott have been featuring ladylike gloves on the runways, in every color you can imagine. Many were fingerless designs, so you can still use your smartphone! Just as earrings were big and bold, so too were bracelets. 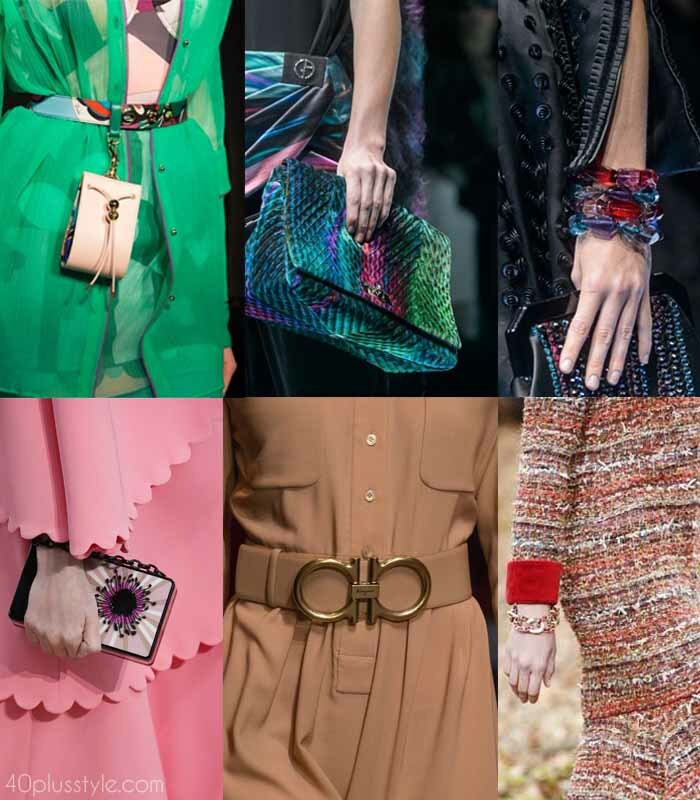 While there were some delicate bracelets on display, most designers favored chunkier wristwear. 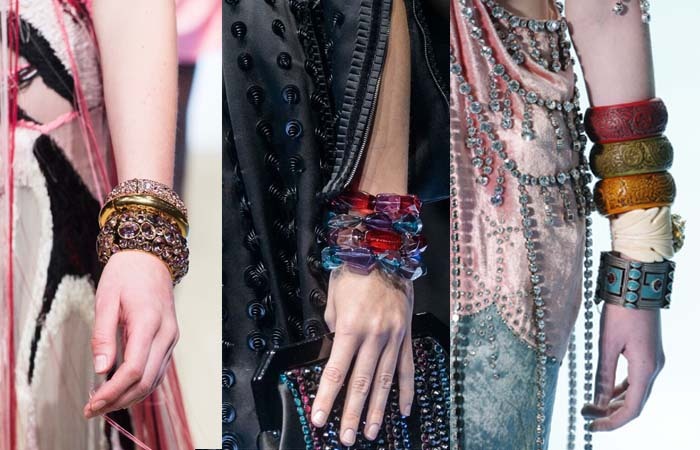 Cuffs were striking and sculptural, able to be worn on their own to make a big statement, or stacked up the arm. Not just for holding up your pants, but for adding extra interest to your outfit, waist-cinching belts were featured worn either under, or over, outerwear to create an interesting silhouette. 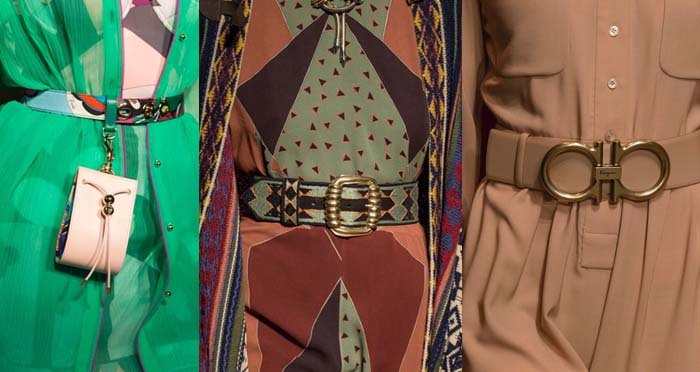 While some designers opted for oversized belts, and others chose instead to use scarves, most added a mid-sized belt to their looks, often with an interesting buckle. Round straw bags were one of the biggest trends of the summer, providing the perfect partner to summer dresses. And, the trend for round bags is continuing for fall and winter, albeit in leather this time! Round accessories were also seen in the form of jewelry, with hoop earrings making a fashion comeback. Megasized bags, megasized earrings, and now megasized chains on jewelry. 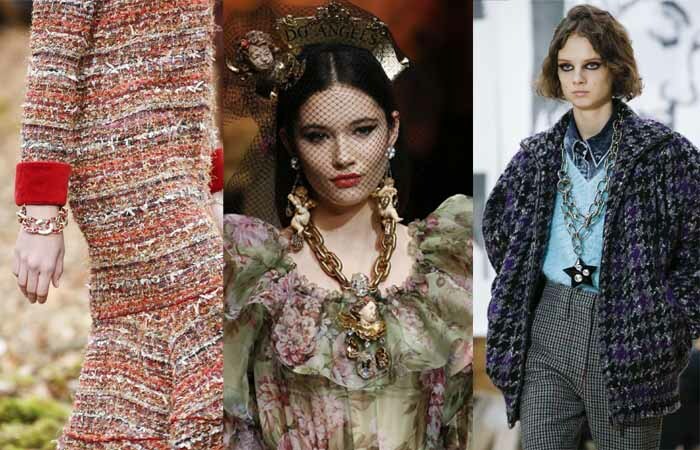 Rather than simply being a vehicle to hang a pendant on, chains became the main focus of jewelry seen on the runways of the likes of Dolce and Gabbana and Chanel. Opting for a big chainlink bangle could mean ticking off two trends in one, given that big bracelets are very on trend for Fall 2018. Or, you could team a statement chainlink necklace over a white shirt. 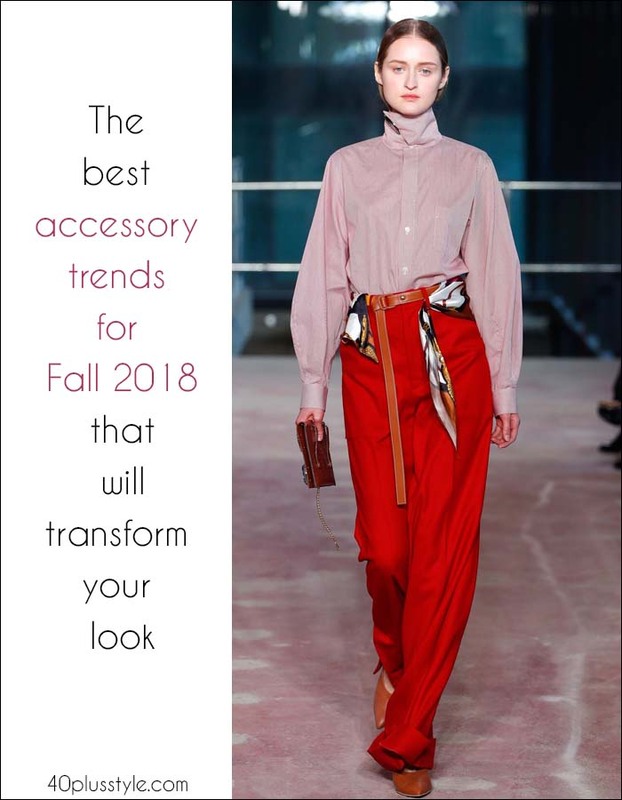 Just as flowers featured heavily in the clothing trends for Fall 2018, so too were they a big inspiration when it came to accessories. Valentino used flowers on evening bags while Chanel made bags which were in the shape of flowers. Meanwhile, Dolce and Gabbana, which always showcases such beautiful bling, adorned models with floral brooches. 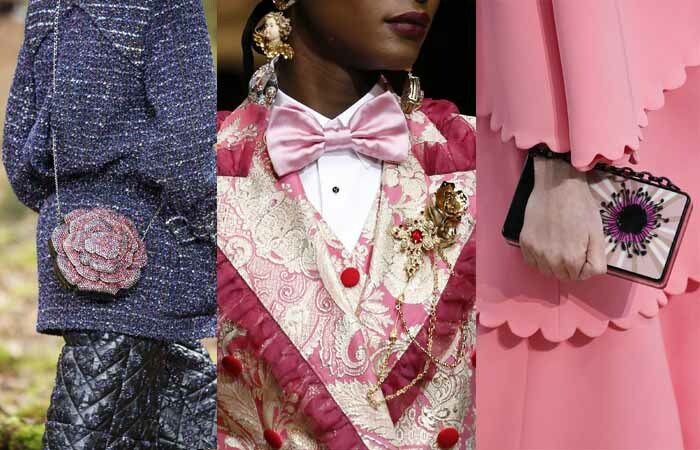 What could go better with some of the other heritage trends, such as plaid and silk scarves, than pearls? 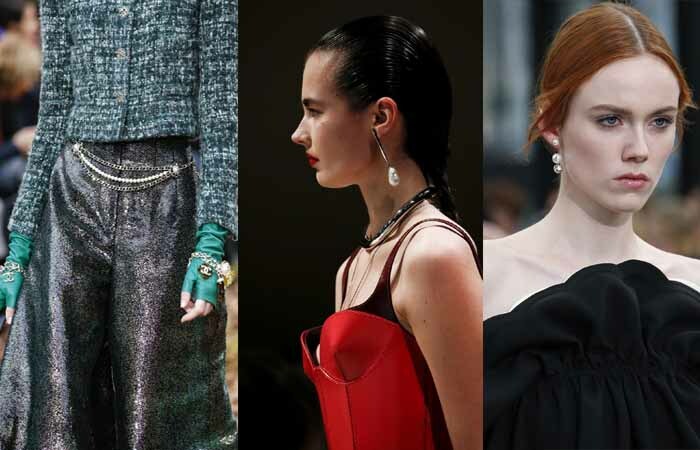 Often seen as something old-fashioned, pearls are definitely making a stylish comeback for Fall 2018, seen in earrings, necklaces, and even belts in the Chanel show. Hopefully, you already have some in the back of your jewelry box! Want to see more trends for fall and winter 2018? 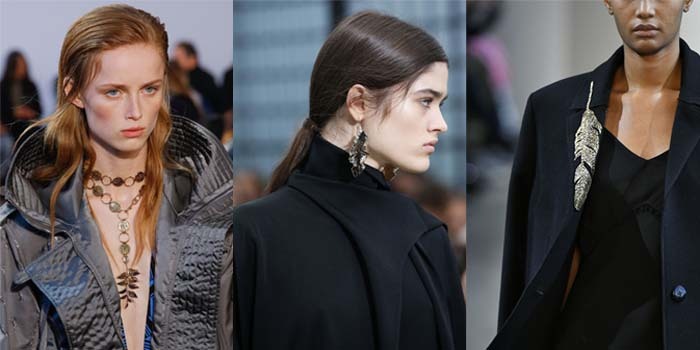 Which is your favorite accessories trend for Fall 2018? What trend do you already have in your closet and what will you be buying for the season? I recently bought a beautiful cuff bracelet (second hand) with lots of sparkly stuff. I have a drawer full of scarves. Might need something in the belt department. Chain necklaces: plenty of them (although not metal, but I do have one big chunky one in blue and gold). Bags: all sizes (although I am recently investing in small cross body bags.. just as they get big again). Chandelier earrings.. hmm not for me. Gloves? I have a few but I don’t find them handy to style with as I never wear them indoors. I am informed again. Thank you. I am excited about these trends! Thanks for sharing. Excellent ideas to organize my Fall wardrobe! Now to dig through my stuff and see what I’ve already got that I can use. Thrift stores should be a good source for bangles, broaches and chain link necklaces. So pleased we’ve given you some good inspiration! Let us know what you buy! Previous post: 12 shoe trends for Fall 2018 – and the hippest shoes in stores now!